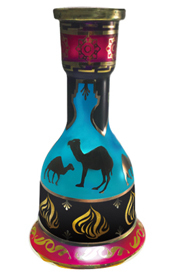 The Egyptian Style Camel Signature Glass Hookah Vase is ideal for replacing a damaged vase or for providing an alternate vase to enhance the appeal of your Hookah. 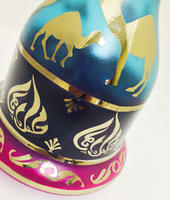 Egyptian Style Camel Signature Glass Hookah Vases are handmade and enhance the decor of any environment. 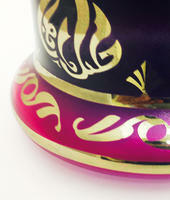 The bold, gem toned color palette perfectly accentuates the details of the golden camels and fire and floral patterns. 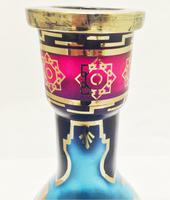 The Egyptian Style Camel Signature Glass Vase is guaranteed to fit most Medium and Large Style Hookahs as well as Medium and Large Khalil Mamoon and Egyptian style Hookahs offered in the industry with the right combination of available hookah vase grommets.